America's heritage is all about finding your dream! The Radio Flyer Company is an American success story. I like success stories. Nothing buoys my spirit greater than reading about one man's dream becoming a success through his own imagination, vision, persistence and hard work. 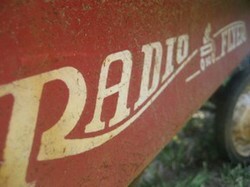 The Radio Flyer Company is one of those stories. The company was started in the early 1900's by a 16 year-old boy who immigrated to America from Venice, Italy, with only his woodworking skills. Antonio took on any and every job he could find to earn enough to start his own business. He set out to build a life and fulfilled his dream in the process. His name was Antonio Pasin. He came to Chicago as many immigrants of that era did to find and live out his American dream. He went far beyond that in accomplishment. He not only built a toy empire; but gave his children and grandchildren the opportunity of living the same dream. What more could a man want from life? A toy for every boy and for every girl. 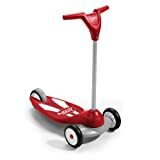 Radio Flyer has seen it's way through the decades by keeping to it's original purpose...and that is to provide toys "for every boy and for every girl". This mantra continues today. The business has passed down from generation to generation. It's great to see a family tradition being maintained and protective of it's original purpose and business vision. The toys have always been an integral part of many children's lives. A young mans' dream of owning a wagon turned into his life passion. That's how many dreams come true. 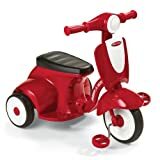 Did you own a Radio Flyer wagon, scooter, or tricycle? Yes, they were great toys! I bought Radio Flyers for my children. I bought Radio Flyers for my grandkids. Did you grow up with run down and wore out toys? I'll bet your tricycle was better than this relic! I was never fortunate to own any Radio Flyer toys. I was the last of six children and I tailed behind 3 older brothers. What I remember was a hand-me down tricycle and a scooter that had a mixture of worn out parts. When I graduated to riding a bicycle...I inherited by brothers bike and somehow I learned to ride putting my legs through the bars to reach the pedals. I don't remember us actually owning a wagon to play with. 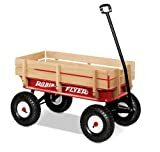 How I would have loved to own a "real and original" Radio Flyer wagon and tricycle. In todays affluent world...new toys are the norm. 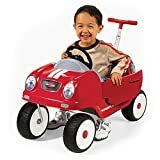 We've come a long way in that area, because not only are the toys new; but they are new designs that captivate the imagination and provides many forms of mobility to children of different ages. There doesn't seem to be a limit on what new toys Radio Flyer will give us in the future. One thing is sure...they will all be good. What fun he's having on his Twist Trike. There's no end to the fun these will bring. Success means hard work and ingenuity. Wikipedia tells that Pasin's company built 1500 toy wagons a day during the Great Depression and how he got involved in the World's Fair in Chicago in 1933. Antonio Pasin In 2003, Pasin was inducted into the Toy Industry Hall of Fame 13 years after his death. Today's Radio Flyer product designs for toddlers are aimed at children who are just building their mobility skills. By the time they are three and four years old, they will be ready for the next line-up of toys that build balance and steering techniques. Scooters are wonderful toys to teach them speed and balance. From there the sky is the limit. We have the radio flyer wagon! We're in the UK, but my boys have a red radio flyer plastic two seater wagon. Brilliant for trips to preschool and the zoo. Yes, we had a lot of fun. I remember a wagon we played with as kids. Sometimes I wish I were a kid again, but since I have a 7 year old, I do play like a kid most of the time anyway! He has the Radio Flyer All Terrain wagon and it has survived six years of torment and constant exposure to the elements and looks as though it were only a year or two old! I hadn't heard the story of how the Radio Flyer company was started -- it's a good one! 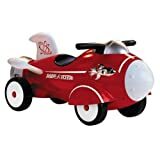 We had a Radio Flyer wagon when I was growing up -- I'm not sure about our trike, but it might've been a Radio Flyer too. I loved seeing your photo (even if it wasn't on a Radio Flyer trike!). i loved my little red wagon and used it often when I was a girl. Now I see them on Fire Island docks to help the weekenders carry their belongings to their houses. I'm not familar with Radio Flyer but do love a story of how one kid with a dream built an empire. Those people who emigrated to the USA with nothing but a will to succeed can't fail to inspire us with their attitude.